Sun, spaghetti and sparkling prosecco. When it comes to looking for love, there’s no place like Rome – but once Kate’s found her man, can she keep him? Let Rome steal your heart this summer in this gorgeously romantic escapist read. Perfect for fans of Jo Thomas and Abby Clements. 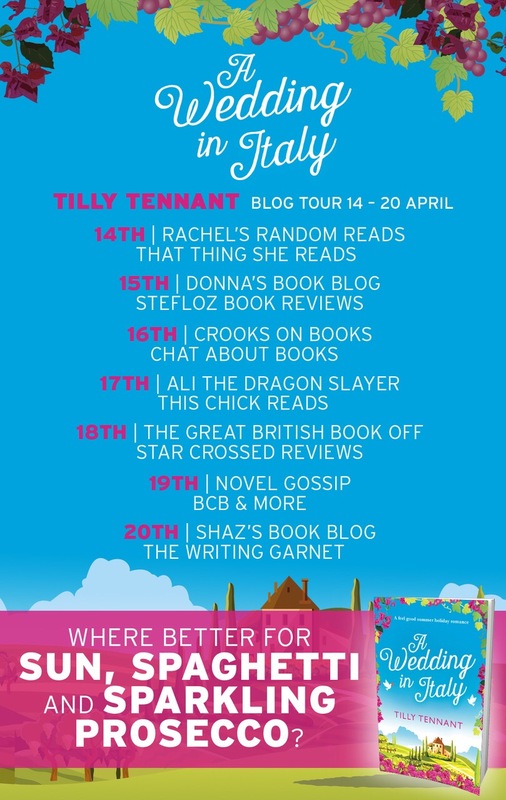 I’m so pleased to be hosting a stop on the blog tour for A Wedding in Italy today! This is the second in a series, I read Rome Is Where The Heart Is last month and thought it was adorable and such a perfect read for this time of year. 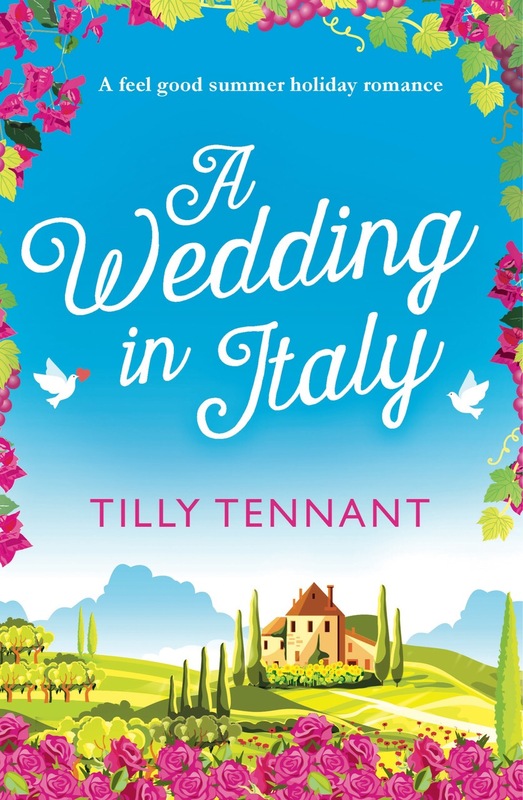 A Wedding in Italy is the same, it’s a fun holiday read that makes you feel as if you’ve just returned from a Roman vacation by the time you finish. What I’ve come to love about Tennant’s writing is that while she conjures up delightful images and swoon worthy romances she still manages to keep things believably realistic. In the first book I was impressed by how Kate and Alessandro were hesitant about their new relationship even though they cared very deeply for one another. This time around she stuck with a basis in reality as Kate struggles after her move to Rome. She misses her family terribly, she’s having trouble finding a job, the language barrier is frustrating and often embarrassing, and though she loves Alessandro more than ever, his meddling family is putting a huge strain on their brand new relationship. It was a nice change to read a romance where things don’t just end with a perfect, happily ever after. This was like seeing behind the curtain when the HEA moment ends and real life begins, it was so refreshing! I really bonded with the characters the first time around and this time I was able to deepen my connection to them even more. Alessandro’s family all play a large part in the plot and I felt similar to Kate as one part of me loved them and the other part wished they would mind their own business. Their Italian dramatics, love of food and family, and loyalty ultimately won me over in the end. Kate and Alessandro are just as sweet as ever and their passion and chemistry was hot and spicy. This is a lovely addition to the series, I would recommend packing them in your bag for your own vacation, they are perfect beach reads. Tennant writes gorgeous, descriptions that make you feel as if you’re strolling along in the streets of Rome and she made me hungry again with the scrumptious food explanations and details. I just hope there will be a third book coming soon?! From a young age, Tilly Tennant was convinced that she was destined for the stage. Once she realised she wasn’t actually very good at anything that would put her on the stage, she started to write stories instead. There were lots of terrible ones, like The Pet Rescue Gang (aged eight), which definitely should not see the light of day ever again. Thankfully, her debut novel, Hopelessly Devoted to Holden Finn was not one of those, and since it hit the Amazon best seller lists she hasn’t looked back. 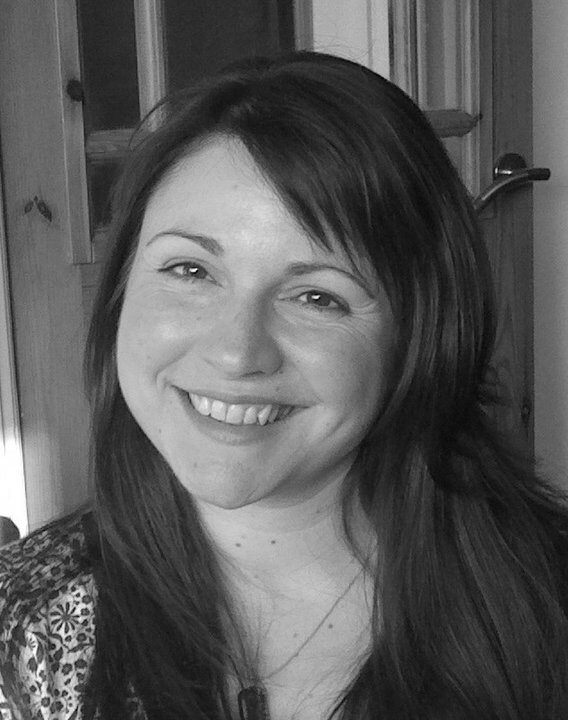 Born in Dorset, she currently lives in Staffordshire with her husband, two daughters, three guitars, four ukuleles, two violins and a kazoo. Since all my grandparents were born in Italy, I would love to go to an Italian wedding. Nice review.